Covering up Apple’s slick iPhone design is unfortunate, but it’s an absolute necessity when you consider how slippery the aluminum on the iPhone is. If you only get one case for your iPhone though, you’re liable to get bored very quickly. After all, the only good thing about using a case on your iPhone (other than protection) is the fact that you can swap it out anytime you want and keep things looking fresh. 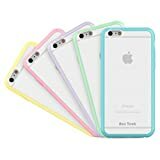 Here’s a great way to start your iPhone 6 or iPhone 6s case collection: from now through the end of the day on Sunday, Amazon is selling a 5-pack of Ace Teah iPhone 6/6s Cases for just $7. Just use the promo code GCKMUFSX at check out and you’re good to go.